Arjun got promoted to IV Std on the same day India won the World Cup. Being a double whammy we decided to celebrate with this brownie. They were so yummy and the kids kept asking for more. 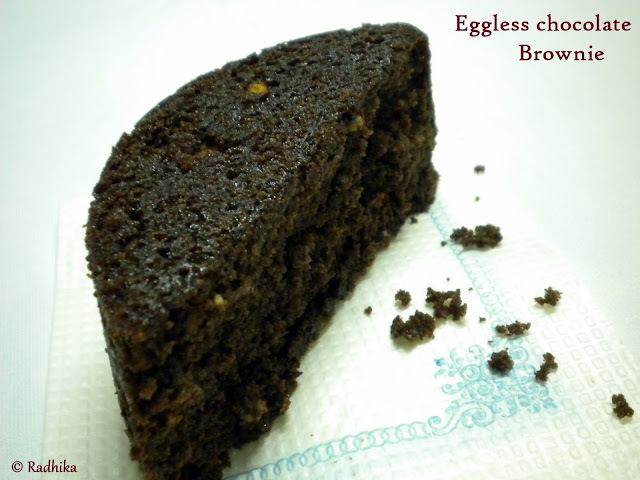 It seems just like yesterday when I sent these Eggless Chocolate Sponge Cake when Divya celebrated her Blog Birthday. Jeez.. Time does fly quite fast. Mix the sieved flour mixture with the wet ingredients, adding ice cold water little at a time and mixing it without any lumps. Pour the mixed batter into the prepared tin and bake at 180C for about 30 – 40 minutes or until a toothpick inserted in the centre comes out clean. 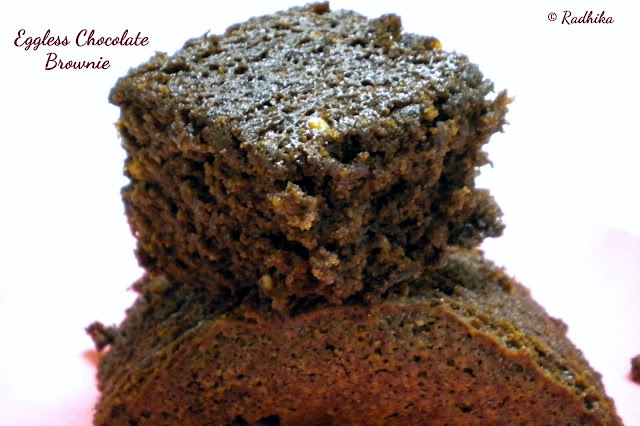 Remove and cool in the pan for 10 minutes before cutting into equal squares and enjoy with evening tea. It freezes very well and a great snack for the kids for their break time. It tasted just right both chewy and sticky. Note: It took me 40 min to get done. I left it inside the oven after switching off for another 10 mins. I let it cool completely before shoving it in the refrigerator for 1 hour before slicing them. It was a breeze. These brownies are off to Divya’s Best Brownie Event. 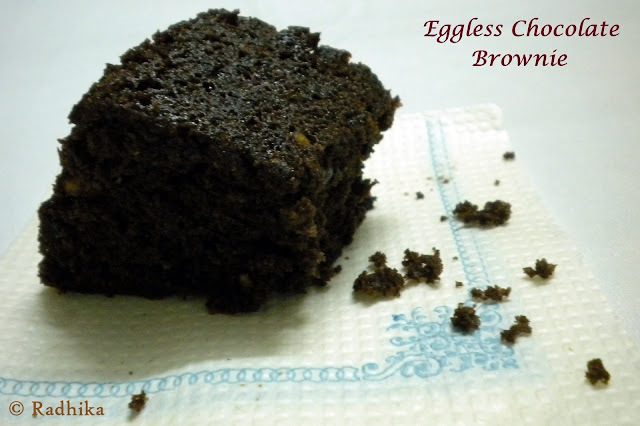 lovely..brownies are my favo..and eggless sounds too good.. Sounds really nice and looks indeed sinful! 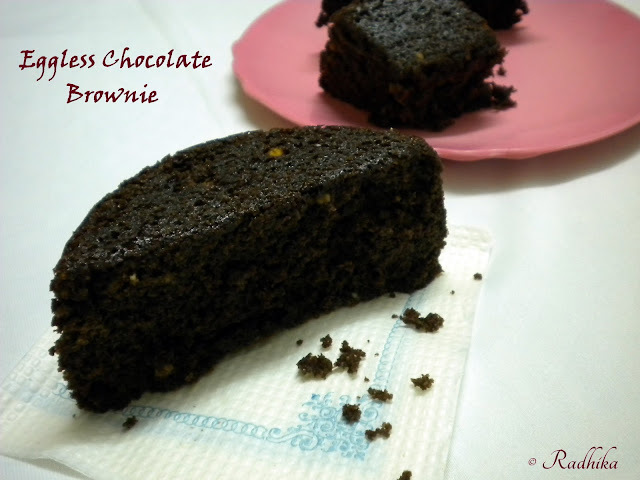 this looks gorgeous…delicious..since long i was waiting for an eggless brownie recipe and there u have posted ..thanx a ton..bookmarking ! Brownies look awesome dear. What a soft and delicious looking brownie! Brownie looks simply divine and irresistible,congrats to Arjun..
wow..these brownies look absolutely gorgeous….too tempting to resist ! wow so soft and superb brownies !!! The brownies really tempt me. Looks very moist and soft. Yummy eggless brownies Radhika! will add it to my bookmarks! Thanks for stopping by my no butter no egg one bowl- banana bread. Why don’t you send this delicious brownie to my week long sweet celebration event to celebrate our historic World cup vistory? 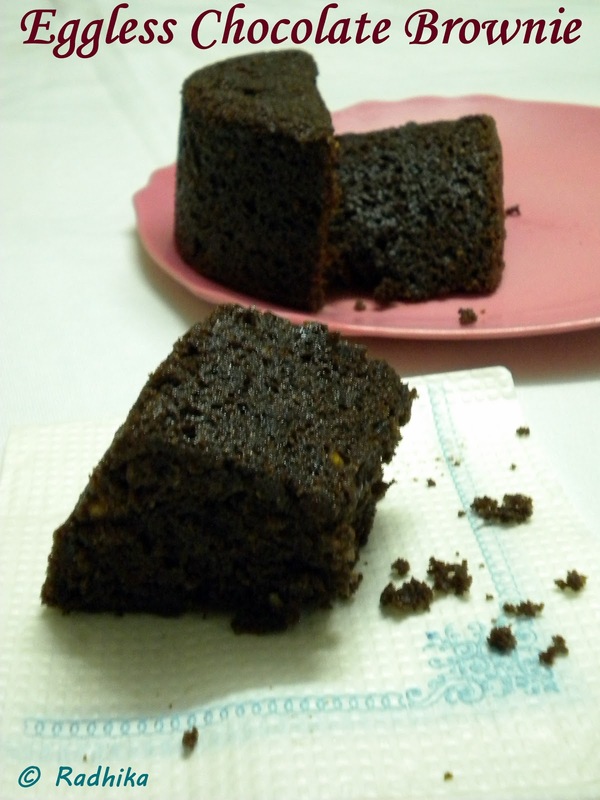 Yummy , moist browines..Loved it. Brownies are my all time favorite. My friend is allergic to eggs. I always search for eggless recipes to bake for her. I am bookmarking this. Welcome Parvathi. Happy to hear that it came out well. Sounds your kid is also like mine. They love it iced too.